Follow these tips to avoid turning minor gunsmithing mistakes into expensive problems. At-home gunsmith projects are great. Working on your own gun creates a deeper familiarity and connection with your firearm. But if you make a mistake, the task can easily turn from a quick fix to an expensive project. Do your homework. Start by reading your gun’s owner’s manual. If you don’t have one for the gun, many manufacturers have owner’s manuals available for free on their website. There are also many great reference manuals available to aid in the disassembly and assembly process. For example, Brownell’s Gunsmith Kinks books are a collection of hints from professional gunsmiths and hobbyists alike. Gun Digest’s Step-by-Step books are top notch and the NRA offers several informative books such as “The NRA Gunsmithing Guides.” Nearly every make and model of firearm can be found in these books. Some are easier to read and understand than others, but many have pictures to help get the job done right, including hints and tips for difficult steps. Don’t jump into a big project first. Start with a simple job, like fixing minor surface rust on a blued finish. This little task can make a huge difference in a gun’s appearance and function, and rust can often be cleaned up using steel wool and a healthy dose of gun oil, followed by a bit of cold bluing. Other projects—like refreshing the paint on your sight, mounting a scope or a detailed gun cleaning—are great do-it-yourself projects. Instructions for detailed gun cleaning, including the disassembly of the component systems of your firearm, are often listed in your owner’s manual or reference books. Once you are familiar with this type of work, ease yourself into more complex tasks. A clean work space is important when you are dealing with the small parts of a gun. Having to locate a small spring or pin in a dark, cluttered work space can be a real pain. So, the first think you have to do is clean and brighten your work bench by painting it white, laying down a clean painter’s drop clothe or taping down some white poster board. Also, only keep the tools and parts that you need for the immediate job in the area, and put everything else aside. You can use double-sided tape to secure small screws, pins and other parts to your workspace so they don’t disappear, and a rotating reading light puts light where it’s needed. Since, a missing part almost always means a trip to a professional gunsmith, you can never have enough containers to keep your parts from being lost. When disassembling, use one of those clear tackle boxes for parts. By having a compartmentalized box, you can put your parts away in the order they came out, saving you the headaches of figuring out which part belongs where. If you get stuck along the way, you can easily re-trace your steps. When dealing with captive springs, you can also work inside a two gallon Ziploc bag—this way, if you lose control of a spring, it stays inside the bag, instead flying across the room. You’ve heard it a hundred times—and now, you’ll hear it again: Having the right tool is essential. Using the wrong size screwdriver can very easily damage screws and the finish on your gun if you slip. You should also have a couple of brass punches for visible areas, and a good hardened-steel punch set for really tight-fitting pins. There are many good, affordable gunsmith screwdriver kits available on the market. Wheeler and Brownell’s tool sets are what the pros use, and they are a wise investment for the long run. Many companies like Gunslick Pro and Weaver offer advanced gun-cleaning kits and maintenance stations with gun vices. 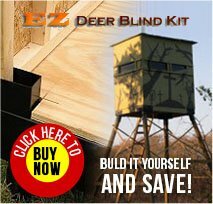 Plus, they offer specialized kits like Weaver’s comprehensive Scope Mounting Kit to ensure you always have the right tools on hand for specific jobs. If you are replacing parts, always compare your new parts to what came out of the gun. Subtle changes in the manufacturing process can mean minor part variances. Check any springs or parts you replace to ensure they are similar in length and diameter. Remember that if a new part does not fit properly, you should just reinstall the original. A poorly fitted or wrong part can make your gun malfunction, which can also make it dangerous. Most aftermarket parts come with directions, but if you get stuck, call the manufacturer and ask its Technical Service Department how to proceed. 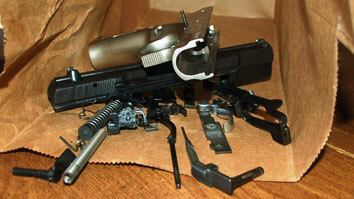 When working on your gun, don’t force it when taking something apart or putting it together. Take your time and make sure your parts are lined up properly. If you are frustrated, take a break. Many times, parts will easily come apart or fit back together when you are rested and relaxed. For some complicated assemblies, you may need to use a “slave pin.” Slave pins are special, cut-to-fit pins that allow you to assemble parts groups outside of the gun, then you insert the assembly and allow the original pins to drive the slave pins out of the gun. And, if you are going to be doing quite a bit of work, consider buying an inexpensive Arbor Press for pushing in/out pins and other parts. Often overlooked, a gunsmith’s torque driver is a valuable addition to your workbench. With scopes running into the thousands of dollars, no one can afford to kink or dent an expensive scope. Hitting your inch-pounds specifications is critical to properly mounting a scope. A torque driver will also prevent you from stripping your mounting screws, which would need to be drilled out and replaced if damaged. Know your limitations. Thorough cleaning, fixing loose parts, replacement of worn pins and mounting scopes are all fine do-it-yourself firearm projects, but some things are best left to the professionals—especially working with triggers or safeties, and hot-salt bluing. If you are interested in doing more advanced work, be sure to buy some advanced books or take a class. The NRA offers several classes with some of the best gunsmithing schools in the country. Do-it-yourself gunsmithing projects are fun and can save you money. But if you are lost, confused or stuck, swallow your pride and bag it up. Sometimes having to get the job done right by a professional is completely unavoidable. Just laugh it off and let them do their job—that’s what they’re there for!